Tungsten Carbide Wedding Rings Sizing Can Easily be Found. 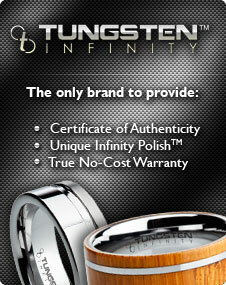 Here at Mens Tungsten Online we want to make your online ring purchase as easy and hassle-free as possible. Ordering the perfect size is easy to do! We offer a free finger sizer to anyone interested in purchasing from Mens Tungsten Online. Simply fill out the form below and a complimentary finger sizer will be sent to you. This finger sizer is not to be used as the absolute finger sizer for custom rings. For custom rings please check the box on the bottom of the ring page that you are ordering to request the actual ring 'blank' (before inlay process is started) be sent to you for size verification. Below is an image of the actual plastic finger sizer we will send to you at no cost. Make sure the ring is comfortable when it's on your finger. When a ring fits properly it should slide on easily, but will resist just a bit when coming off, even taking 2-3 seconds to get back over the knuckle. This is normal, and especially common with men, who typically have larger knuckles. If you size your ring to your knuckle, it will be too big on your finger. More sizing mistakes are made ordering rings too large than too small. Your finger size will change slightly throughout the day, depending on temperature, activity, etc. Fingers tend to be a little puffy in the morning, they shrink a little when cold and expand slightly when hot, but typically settle into a normal size during the day. For this reason we recommend that you measure your finger during normal temperatures and at the end of the day when your fingers are most normal. You will want your ring to fit perfectly and be able to be removed easily at this time. Please remember that the wider your wedding band is, the tighter it will fit. Proper ring sizing is more of a personal preference than a perfect science, so even after following all of these helpful hints, sometimes the ring still won't fit perfectly. Don't stress! We are happy to replace your ring with a different size for you! 1) Go to a jeweler and have your finger sized (Make sure you are being sized for a ‘comfort fit’ ring). Then come back and order from Mens Tungsten Online for the unbeatable pricing and the Tungsten InfinityTM Brand! REMEMBER - Our mens tungsten wedding rings are Comfort Fit style, which means extra metal is used to make the inside of the band slightly domed, resulting in a very comfortable fit. Although Comfort Fit wedding bands are more expensive than non Comfort Fit bands, we strongly recommend them for widths of 6mm and wider. The Comfort Fit design is especially recommended for men because it is easier to squeeze over a large knuckle when putting your ring on or taking it off and is much more comfortable to wear once it's on. 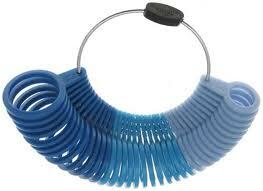 2) Use our printable Ring Sizer. NOTE: In the Print dialog box, make sure that you do not have "Shrink oversized pages to fit paper size" or "Expand small pages to paper size" selected, and that Page Scaling is set to None. 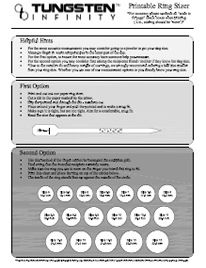 Use Method A or B on the Ring Size Finder printout to determine your own or someone else's ring size. 3) Measure your finger with a string. Wrap a piece of string or a paper strip around the base of your finger. Compare your measurement with the chart to determine your ring size. NOTE: Use the string method as a last resort only. Best results are obtained when you use our free finger sizer or go to a jeweler to have your finger sized. If after converting your size into the US/Canada size (our size) and you find you are either on a 1/4 or 3/4 size; select the nearest half or whole size below (eg. If you are an 8 1/4, select a size 8. If you are a 8 3/4, select a size 8.5). Don't worry if you've ordered the wrong size. Just ship your ring back to us, and we'll re-size it any time. See our warranty for details. *Tungsten rings tend to run a half size larger then other metals. This is partly due to the comfort fit of our rings.